With the NHL playoffs about to start, take a refresher on how teams are ranked this year, the first under the league's new post-season format. First, a brief recap of regular-season realignment: instead of 15 teams in each conference, there were 16 teams in the East and 14 in the West. They were grouped into four divisions: Atlantic, Metropolitan, Central and Pacific. Just like under the old system, eight teams from each conference make the playoffs, but it's no longer a simple matter of the top eight teams in the conference qualifying. The top three teams in each division automatically get in, accounting for 12 of the league's 16 playoff berths. The final four spots, two per conference, go to the teams with the highest point totals who finish outside of their division's top three. These are the wild cards. This format allows for the possibility that any given division could send as few as three teams to the playoffs, and as many as five. Once the playoffs start, ​the two division winners in each conference match up against the two wild-card entries (the division winner with the most points faces the wild-card team with the fewest points, regardless of which division they play in). The other matchups are intradivisional: the second- and third-ranked teams in each division square off against each other. The winners of these series move on to the second round to play for a spot in the conference finals. Unlike in past years, teams will not be re-seeded after the first round. Instead, a bracket system is being used, wherein potential opponents can be identified in advance. To help visualize a potential first round, here's an example of how the playoffs look in the Eastern Conference. Atlantic: Boston (awarded East's top seed as division winner with most points). 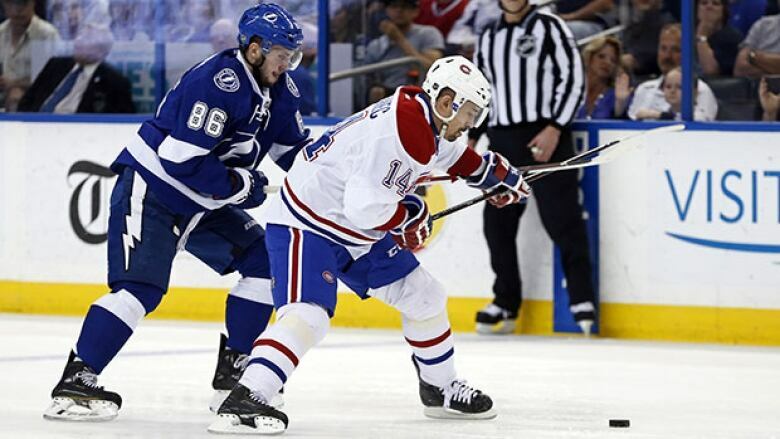 Atlantic: (2) Tampa Bay, (3) Montreal. Metropolitan: (2) New York Rangers, (3) Philadelphia. Wild card No. 1: Columbus (most points among the two wild-card teams). Wild card No. 2: Detroit. Boston (best division winner) vs. Detroit (worst wild card). Pittsburgh (second-best division winner) vs. Columbus (best wild card). Tampa Bay (Atlantic No. 2 seed) vs. Montreal (Atlantic No. 3 seed). New York Rangers (Metropolitan No. 2 seed) vs. Philadelphia (Metropolitan No. 3 seed). Winner of Boston/Detroit vs. Winner of Tampa Bay/Montreal. Winner of Pittsburgh/Columbus vs. Winner of Rangers/Philadelphia. An earlier version of this story stated that teams are re-seeded after the first round. In fact, a bracket system is being this year.